The 2017 Limassol Marathon GSO has been launched and entries for the race are now open. The popular event will take place in Cyprus on Sunday 19th March 2017. The 2016 race took place under blue skies on Sunday 10th April, and welcomed 13,000 runners to the island's largest sporting event. 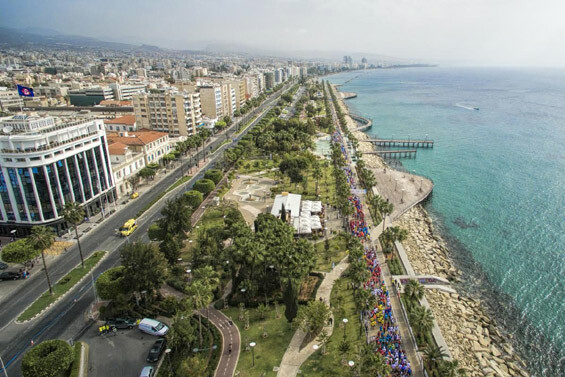 The race is known for being flat and fast, covering long stretches of straight, traffic-free road, including the spectacular coastal road of greater Limassol. This makes it ideal for first time marathon runners as well as for professional athletes looking to achieve a PB. Now entering its eleventh year, the Limassol Marathon GSO is fully accredited by AIMS, the Association of International Marathons and Distance Races. The 26.2 mile route takes runners from the palm tree-lined seafront of Molos, in the centre of Limassol, to the new port, the old harbour and the ancient ruins of the Royal City of Amathus, dating from 1100 BC. It stretches for 21km along the beautiful Mediterranean coastline, reaching a maximum altitude of 18m and providing runners with magnificent views and a refreshing sea breeze. Add pleasant spring temperatures of 9-17�C, and low rainfall in March, and it really is an ideal location to run a strong race. The Limassol Marathon GSO is quite unique in that it offers a number of different races on race day. In addition to the full marathon, there is a Half Marathon, a 10K Energy Race, a 5K City Race, a 5K Corporate Team Race and a 1K Kids Race. Together these races offer a complete sporting experience for all ages and abilities, which is very much embraced by the thousands of participants and spectators who come to the start line to cheer the participants on. Overseas visitors can expect a friendly and celebratory atmosphere in a beautiful seaside location, as well as the highest international running standards. The 2016 men's marathon title was won by Tomasz Klisz of Poland in 2:41:47, and the women's marathon title was won by Sylwia Bondara of Poland in 3:12:40. Limassol Marathon GSO Race Director Vasilis Vavalos commented: "We are delighted to launch the 2017 Limassol Marathon GSO and to be accepting entries for next year's event. This will be our eleventh marathon and we are looking forward to welcoming people from all over the world to the many races that will take place on the day." "We are proud to offer a welcoming atmosphere, a beautifully flat and straight course, stunning scenery and great weather " all of which make Limassol a high quality destination for the international running community and their families. It is also an important event for the locals who come out to support the runners and join in the festivities, making it a very special day for all involved. "Places for the 2017 marathon are now open and we would encourage runners to secure their place on the start line as soon as possible." An early bird discount for individual race entry is available until 30th November 2017 at a reduced rate of 40%. Running club members benefit from a 50% discount for entries submitted by February 2017. Go to http://www.limassolmarathon.com for further race details and to sign up now.